Children and Divorce: Information, tips and real life stories for divorced parents. Your life has changed and now you have to deal with your new reality. With a positive mind set, it will be much easier. You will learn why and how you can achieve just that. Week 3 - Erikson's 8 Child Development Stages and the impact of divorce. Understand the consequences of your actions and attitudes on their lives at each stage. How to recognize a healthy development? Understand the critical issues at each stage and learn how you can help your children developing in the right direction. Where do you stand as a parent and when? Before your child, aside, behind or nowhere? Facing reality. Dealing with failure and being a good parent starts from within. How to embrace the stepparents? Why should you aim to keep the family out of courts? How to divide the assets and the debts? How to share the costs of your children? Start looking beyond the accepted norm of your country and focus on the children instead. Put more into your life, to get more out of it. The 5 main principles withholding your personal change and that of your children will be explained. Put more into your life to get more out of if. Tools that will help you and your children embracing change. Children and Divorce.com Disclaimer: the information in this program does not provide any legal advice. If you are unsure about legal or other decisions to be taken, please consult a local professional on beforehand. Are you a divorced parent or a parent planning for a divorce? If yes, Children and Divorce is a place to be. We collect and update all the relevant topics, resources, stories and insights for you. A lot of books, web sites, counselors, psychologists, support centers and lawyers involved in Children and Divorce write and preach about everything that can go wrong. They highlight the possible negative outcomes of divorce on children, like under performance at school, poorer social skills or even depression. However, only a minority of the children of divorce suffer from the negative effects. Do these specialists and resources contribute to preventing or solving these problems? Or do they create problems that actually do not exist? Do you and your children really need help from professionals? Does the divorce cause the problems or is it something else? Of course, your divorce does hurt your children emotionally. They will feel pain. You will feel emotional pain. The divorce will hurt your feelings and it will undermine your and your children’s self esteem. But the pain will disappear. The memories will stay. That is all very natural. There are common beliefs about divorce like: Divorce is bad. 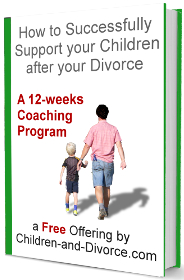 Life after a divorce becomes more difficult for you and for your children. The divorce has negative consequences for your children. You and your children will have to “cope” with the new situation. The future perspectives for your children are negatively affected. Indeed, statistics show that children of divorce do worse at school and in university, have more difficulties to involve in social relationships and have higher divorce rates themselves. But those are just statistics, averages that do not apply to everybody. Fortunately, there are also many examples of children that thrive after the divorce. Those divorced parents did not accept this mediocre perspective. They chose differently. They aimed for a happy, bright and thriving future for their children and for themselves after the divorce. They took action. With or without professional help. And they succeeded. Children-and-Divorce.com helps you to find your way by providing relevant information about Children and Divorce. Did you everything to stay together? How and what do you tell the children? How to limit the negative effects of divorce on children? There are valuable books and very good professionals out there to support you and your children on the journey to success. The divorce lawyer asked the couple: “why do you want to divorce after being married for 65 years?” “We agreed to wait until the children died”, the man answered.